There simply just comes a time when a sandwich is the only thing you want to eat - we often crave this handy delight for the easiness and the variety they offer. Anything can be used to make a sandwich - they no longer require bread as lettuce has become the new wrap and leftover pancakes have replaced sliced bread. 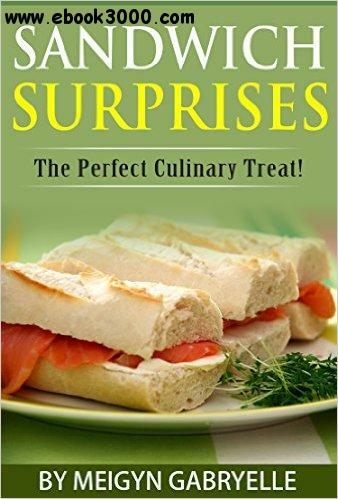 This book offers you a wide selection of sandwiches - some very quick and easy, others that take a little bit of time, but are well worth the effort in the end. You'll find new ingredients and new ways to use old ingredients in a sandwich - and you'll love the versatility of these recipes - mix and match or substitute at your will. Whether it is a quick sandwich for breakfast or lunch, or a family gathering where this delightful culinary treat is perfect - you'll find something for everyone in this book. [Fast Download] Sandwich Surprises: The Perfect Culinary Treat!